MLM advertising is frequently done in the classifieds. Multi-level marketing (MLM) is a method of selling products that is heavily focused on recruiting more salespeople. Opportunities for MLM advertising are found everywhere, from the online advertisements to newspapers, bulletin boards and even telephone poles. MLM advertising takes many creative paths toward getting the word out on particular products and recruiting opportunities. Multi-level marketing, at its foundation, consists of distributors, sellers and recruits. A good example of this type of selling would be a door-to-door vacuum salesman. The distributor with the vacuums seeks out sellers to purchase the vacuums at a reduced rate, and then that person is responsible for selling the products. In order to earn more income, the seller can recruit others to sell vacuums and earn money by taking a commission from these other sales, essentially becoming a middleman. In modern times, the army of door-to-door salesmen has been replaced by computer users, and house visits have been replaced by clever online MLM advertising. One of the most popular ways to get the word out on MLM products and recruiting opportunities is to purchase online advertising space that takes interested parties directly to the product's website. This saves the seller a lot of time from having to search out customers by having them go straight to the source. In addition, this can be used by recruits to send sales leads to the seller. Article writing is a less invasive way of educating the public about a product and directing them to a particular website in order to make a sale. Typically, a seller writes an article about a topic related to the product that he or she is selling, such as the many benefits of a particular cleaning agent. This type of advertising works best when the articles are distributed to websites that specialize in the product being sold, such as a cleaning tips website. The article references the seller's site and encourages sales through providing information and developing trust. 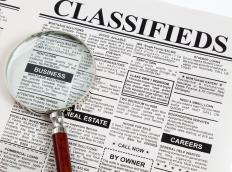 The oldest and still an effective method for advertising MLM products is to use physical advertising space, such as classified ads. Newspapers still run classified spaces for selling products and business opportunities, and these can be a great place to find buyers. Places such as telephone poles and community bulletin boards are perfect for MLM advertising, especially if a lot of foot traffic passes by the location. Creating an advertisement on a sheet of paper and posting it in these places is an easy way for potential customers to consider whatever product is being sold. Another form of MLM advertising involves a seller or distributor placing a sign or sticker on a vehicle so that many people will see it as the vehicle is driven around during the course of a day. What is the MLM Industry?